Okay, so it's crunch time now. I have a great opportunity to launch this project this month but still, it's not going to be easy, not even remotely. Fortunately, tools like Unity and PlayMaker make it at least a little easier, taking it from 'almost impossible' to 'maybe I can do this?'. The interaction blocks seen faintly in the background of the above pic are less than 7% of the interaction logic in the game at this time. By launch? Maybe 5%. And each of those blocks (called 'states') has sub elements not seen. Like actions, logic comparisons, variables and arrays. If any of the players complains about features not being good enough, well, yeah, I know there are only 12 manual save slots. And yeah, I get that there aren't even multiple player profiles. And yes, sure, the options menu doesn't have a ton of gradations in the settings and the inventory system's a bit clunky. 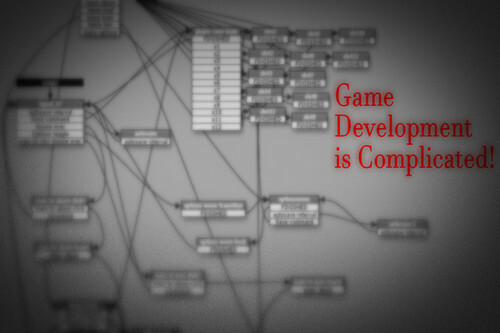 But the reason is usually that I'm an indie dev and this is the best I could do with it given my current skill level. I am not a programmer. Even a visual scripting system like Playmaker's FSM design, is not my strong point. I'm a visual artist. And right now instead of the much-derided 'programmer art' that looks like it was made in MS Paint... you're getting good graphics, at the cost of imperfect interactions. In other words, 'artist code'. That's why the dream is not to get near the top of the 'Indie' category. It's unrealistic and simply logically won't happen. The dream is to be somewhere in the middle of the pack. But as long as I can get above the bottom 30% of indie titles then that means 'Miniature Multiverse' will make it to the finish line of its development, and we'll all see world #23 in the final update about a year from now. (Well, everyone who actually gets that far on the puzzles, anyway.) So being in the top 70% means completion of this project and it reaching its full potential. Being in the top 60% means I can also go bigger and more ambitious on the next projects I launch, with better resources, improved hardware/software and even commissioning a full soundtrack by a musician I have a connection with. And 50%? Wow - 50% would mean I could actually hire a programmer part time maybe in the near future. Not to do all the interactions but, to solve whatever scripting challenges have me stuck. I'm not going to give exact sales numbers, when the game's released, but I will note that you can view the rough statistics on SteamSpy, which'll give you a good sense of how things are going after launch. Could turn out great, could make just enough to reach completion of the storyline [I'd like $3000+ to work with so I could do the rest of the game really well, but could probably pull the essential stuff off, a little lower quality, with $2k or less if I had to], and it's altogether possible it'll make practically nothing and that'd be a disappointment but not really a surprise. Right now, what I have left to do is mostly wrapping up the sixth secret area, [aka world 6] and getting a few improvements made to a complicated ambient animation in Cliak. Plus there's a couple nodes in Sedest where the water elements aren't loaded in yet, and there's the issue of setting up savegame data so it'll be consistent from the first release to the last. Which means all the variables for every puzzle, all included in the saves and in the code, even though most of them are for areas that aren't in the first release. And there's also the inventory stuff, the puzzle mechanics - I'm not only debugging the inventory now but leaving a lot of slots, a massive array of them, for every possible item that may be picked up in the course of all 23 worlds. Most of those slots will seem irrelevant at first release but they are there so the later updates through a patching system I've obtained, hopefully won't break things! On top of all that stuff with the game itself, there's the issue of earning $180ish through the usual transcription and such, at rates effectively well below the $7.25 federal minimum wage, for the launch on Steam, a couple of routine once-a-month payments, and the promotional efforts and ad campaigns at release - which is thin, miniscule by most standards, but it's all that I can realistically do. We are talking dozens of hours of tedious labor between when the game's done and when I can actually submit to Steam / run ads but that's kind of how things are for me at the moment. I hope this goes well. I've put so much work into this, it's kind of insane.